From goodreads: The golden skies, the translucent twilight, the white nights, all hold the promise of youth, of love, of eternal renewal. The war has not yet touched this city of fallen grandeur, or the lives of two sisters, Tatiana and Dasha Metanova, who share a single room in a cramped apartment with their brother and parents. Their world is turned upside down when Hitler’s armies attack Russia and begin their unstoppable blitz to Leningrad. I’m so in love with this book that I simply cannot find the words to express what I feel at this very moment. This book took me on the most incredible journey and I was completely and utterly captivated. Where do I start?? This is a story about the human spirit and the will to survive; it’s a riveting story about love that blossoms during the most difficult of times. Tatiana is a 17-year-old Russian girl from Leningrad who meets a 22-year-old Red Army Solider, Alexander and the setting is WWII, 1941. They meet by chance and destiny keeps them in each other’s lives but unfortunately there is a love triangle of sorts because Tatiana’s sister, Dasha has been seeing Alexander before they even meet. I’m over simplifying it of course because it’s much more complicated than that but Tatiana being the selfless and amazing woman that she is, puts her sister first before her own heart…no matter how much it pains her. This book is different because war is such a huge part of the story which makes the romance so fragile and intense. It felt so real and every emotion that Tatiana felt, I felt. When she was hungry, I felt those hunger pains. When she was cold, I was frozen to the core. When she felt alone, I was despondent. I. FELT. EVERYTHING. I realize that my review is mostly quotes but that’s because I adore this book and clearly, I can’t find the words to articulate how I feel. This is a heart wrenching story with romance so powerful and so beautiful it will take your breath away. You will fall head-over-heels for Alexander and I dare you NOT to love him because he is that amazing; his intensity and protectiveness over Tatiana will make you swoon. And Tatiana is the woman I want to be; her courage, her passion and her angel like qualities inspired me. This is an EPIC LOVE STORY and one you will not soon forget. Don’t wait a moment longer to read this book! 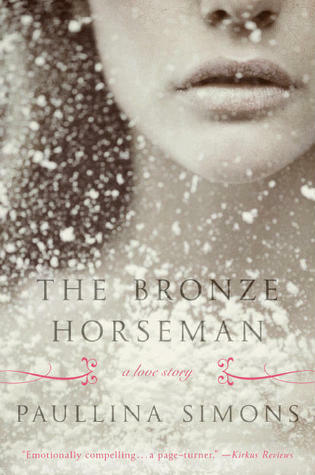 I was fortunate to win a copy of The Bronze Horseman because of Natasha is a Book Junkie and now I would like to pay it forward because this is an EPIC LOVE STORY!!! ONE WINNER will win an e-book copy of this book!! Click on the image below to enter for a chance to win…good luck! Winner will be announced on Sunday, June 23rd (evening EST). I so adore this series! It such a beautiful story. Hi Cezanne! I’m in love with this book! My review is all over the place because I couldn’t seem to get a handle on all my emotions!!! And Shura simply took my breath away!!! Starting book 2 now! Prepare the tissues! Book 2 was just as heart wrenching. I was an emotional mess with this series whole series. I finished book two and my poor Shura broke my heart! Not that Tatiana didn’t but Shura was so incredibly broken. I literally had a hard time shaking that book off. I finished reading it before going out and I needed a stiff drink just to bring my spirits up! I’ve started book 3 and I’m 14% and oh my gawd…if they don’t get their HEA, I might have a major melt down! Omg he was! I tear up just thinking about. My family thought there was truly something wrong because I could not stop crying when I read Tatiana and Alexander. Cezanne: The second book tore me up!!! I was a mess. I read it while I was on my lunch break, at night…my co-workers and family thought I lost my dang mind because I was crying so much! LOL!